The "heart" of the output are XYZ coordinates, which are logged 100 times per second. The software converts the measured profile automatically to the coordinate system of the entered entry and exit coordinate. Output point frequency is user defined. The coordinate files can be uploaded to any GIS platform seamlessly. From the XYZ coordinate data set the moving pipe bend radius is calculated. Bend radius is increasingly a critical design specification for pressurized pipes. Only high frequency data forms a reliable basis to properly assess the bend radius of a pipe. The bend radius can be assessed in both two dimensions (horizontal and vertical plane) and three dimension (most accurate interpretation). Soft ground conditions or natural disasters such as earthquakes, extreme weather, etc. can cause underground infrastructures to shift over time. Pipe shifts may have an impact on the integrity of the pipe or on the flow model associated with it. 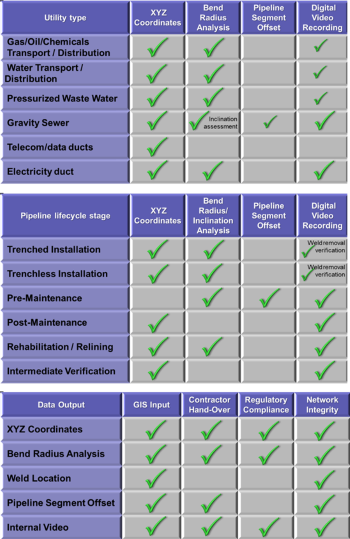 The XYZ coordinate files can be used to quickly establish the level of setting or shift of pipes against design to optimize maintenance, repair or pipeline re-lining planning. 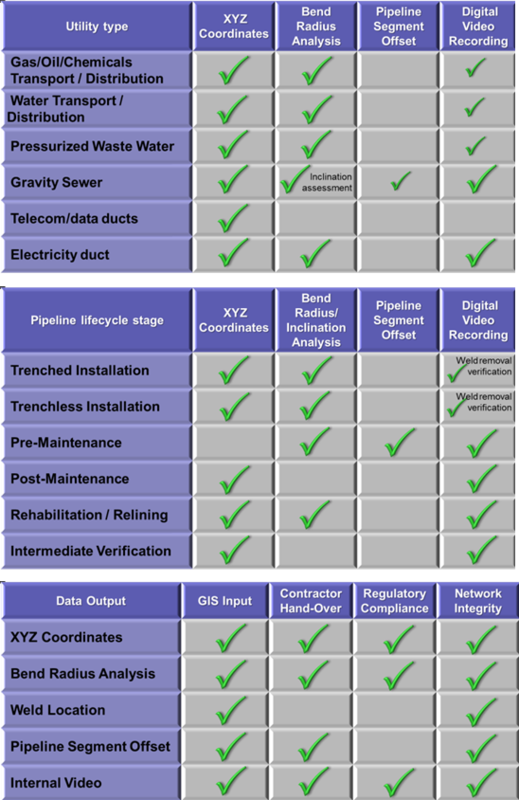 Not to be mistaken with traditional sewer CCTV inspection, the video recording feature's primary purpose is to determine the XYZ location of laterals, welds and any other anomaly that is visible as the mapping probe passes through the pipe. The video feature operates autonomously and can therefore cover long distances (up to 1500m/5000ft). Furthermore, the video recording does not require additional plant or separate operations. The fact that the data frequency is very high and accurate, small weld offsets can be determined. For example, this may be a requirement prior to HDD pull back of steel pipes to avoid unevenly distributed stresses on welds during the pull. Weld offsets are calculated from the uploaded XYZ data into, for example, AutoCAD. The DuctRunner technology adds value in different ways to network operators, engineering firms, surveyors, contractors and others who are involved in the design, installation, operation and maintenance of a pipeline asset. DuctRunner output is instrumental in a number of procedural steps during the installation, operation and maintenance activities of pipelines. Possibly the most important are the checks prior to contractor hand-over and regulatory compliance. Actual cases have proven a smoother project hand-over if a contractor knows in advance the asset he installs, maintains or re-lines will be post-surveyed with a gyro, In fact, some HDD contractors now map their critical pilot bores prior to pulling in the customers' pipe to get a sign-off on position and bend radius. The most common uses of DuctRunner output are summarized by Utility Type, by Life-cycle Stage and by Standard Output.